A few weeks ago I couldn't find my keys... I ran around the house for about 15-20 minutes until I finally checked on top of the dryer and there they were. I've been searching for my camera for at least 3 days. I finally thought I should check on the dryer and of course there it was. I'm so absent-minded sometimes!! So now that I found the camera I can finally update!! First I want to thank you all for your well wishes and kind words - it meant so much! So far no morning sickness, just back pain! I'm surprised it's starting so early this time! I read it's the hormone Relaxin causing it. Oh gee, I should've known it was a hormone!! :) Speaking of hormones, I had such bad PMS like hormones that first week I found out my mom was ready to move away! That has thankfully subsided!! 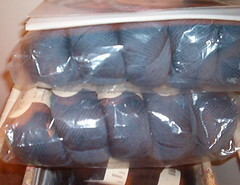 Picture is much brighter than the actual color. And here's a picture of my Jaywalker socks. I'm enjoying these a lot! I love the pattern and the yarn! 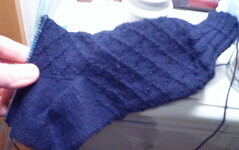 This is my award knitting after knitting on the other socks! 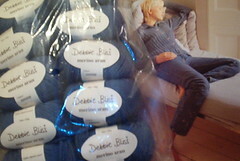 Debbie Bliss Merino Aran for the Moss Stitch Cabled Jacket from Book #3. Color is truer in this picture. Well, that's all for now!! It's so chilly here tonight! The wind is blowing so hard! It's definitely good sweater weather! Well, I'll write more later! I think it might be postive!